David Shier has more than thirty years of experience teaching anatomy and physiology, primarily to premedical, nursing, dental, and allied health students. 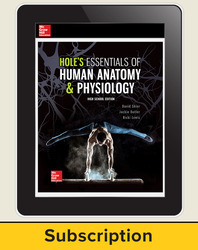 He has effectively incorporated his extensive teaching experience into a student-friendly revision of Hole’s Essentials of Human Anatomy & Physiology and Hole’s Human Anatomy & Physiology. His interest in physiology and teaching began with a job as a research assistant at Harvard Medical School from 1976 –1979. He completed his Ph.D. at the University of Michigan in 1984 and served on the faculty of the Medical College of Ohio from 1985 –1989. He began teaching at Washtenaw Community College in 1990. David has experience in online course delivery, including recording lectures for “flipped” classrooms. He has also explored the relationship between pedagogy and assessment, and the use of tools traditionally associated with assessment (for example, lab quizzes) as pedagogical tools, often associated with group activities. Jackie Butler’s professional background includes work at the University of Texas Health Science Center conducting research about the genetics of bilateral retinoblastoma. She later worked at MD Anderson Cancer Center investigating remission in leukemia patients. A popular educator for more than thirty years at Grayson College, Jackie has taught microbiology and human anatomy and physiology for health science majors. Her experience and work with students of various educational backgrounds have contributed significantly to the revision of Hole’s Essentials of Human Anatomy & Physiology and Hole’s Human Anatomy & Physiology. Jackie Butler received her B.S. and M.S. degrees from Texas A&M University, focusing on microbiology, including courses in immunology and epidemiology. Ricki Lewis’s career communicating science began with earning a Ph.D. in Genetics from Indiana University in 1980. It quickly blossomed into writing for newspapers and magazines and writing the introductory textbook Life. Since then, she has taught a variety of life science courses and has authored the textbook Human Genetics: Concepts and Applications and books about gene therapy, stem cells, and scientific discovery. She is a genetic counselor for a large medical practice, teaches a graduate online course in "Genethics" at Albany Medical College, and writes for Medscape Medical News, Genetic Literacy Project, Rare Disease Report, and medical journals. Ricki also writes the popular DNA Science blog at Public Library of Science and is a frequent public speaker.